I bought my first stock nearly 8 years ago with Scottrade, which is also my first stock broker, in 2002 and one that I have been actively using since then. Throughout these years, as more and more online discount brokers emerged, I have also got accounts with other brokerage firms in order to reduce trading cost, even though the money I saved on commissions isn’t really significant at all. Despite that, I still prefer cheap discount brokers to full-service brokers which offer many services that I will never use but charge much more to trade stocks. While my main focus is always on the cost side when choosing a broker, I find that what a broker offers on its main account homepage also plays a role on whether I want to use the broker or not, though only a small one. If you also look at the broker’s interface, such as functions and user-friendliness, when choosing which one to use, here I have a quick review of discount broker trading platforms that I am currently use. The best feature I like about Scottrade is that it shows the total market value of my account graphically right on the home page. Even though the graphic only covers up to 6 months, it give me a clear view how my investments have changed over time. This is a feature that I didn’t find at any other brokers I am using. 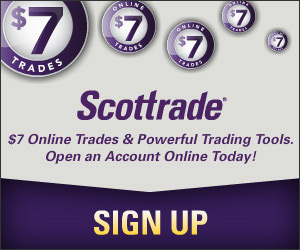 Scottrade doesn’t have charts on its homepage. Quotes are given as numbers only, even though it does have a separate page where I can get plots and all the technical analysis tools. To trade a stock, I need to enter the symbol in the Quick Quote first then provide all the necessary order information (or click the Trade tab on the top). What I feel not very convenient is that for those securities I already own, I have to go through the same steps (enter symbol and order info) to make a trade. Scottrade doesn’t have streaming real-time quotes on its main web platform. However, it does have a free, Java-based streaming tool that opens in a new window (from the Streaming Quotes link on the left) and trades can be made from there as well. 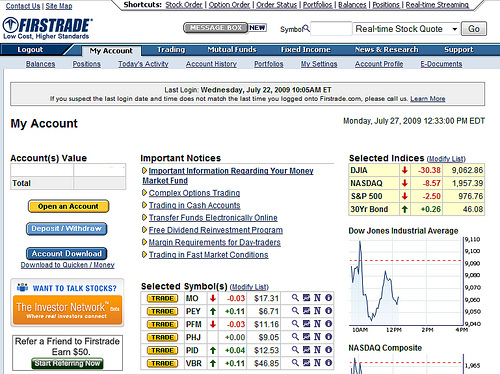 TradeKing probably has the simplest account homepage among brokers I am using. 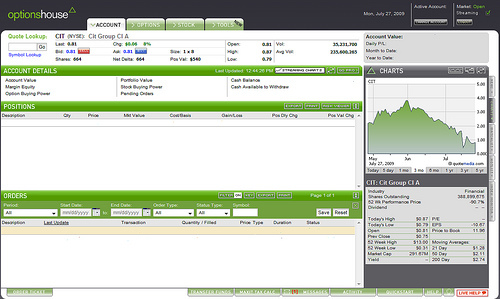 If no buttons or tabs or links are clicked, then I will only see my holdings and account balance and gain/loss. The gain/loss is the one feature I like because it shows the gain/loss, realized and unrealized, since the account is opened, so I know how my trades are doing over all. For most other brokers, I can only see the daily gain/loss. Though TradeKing also has streaming real-time quotes on its web-based platform, but it’s not available to just everyone. To qualify for the stream quotes, I have to make at least 25 trades per month. Well, that’s too high a bar to just get the streaming quotes. There’s no charts on the main page either. To trade a stock, I have to click the Trading tab from the top of the screen, then enter order information. Trading stocks that I already own is a little easier, though (click the arrow on the right of the symbol to make a trade). I once used TradeKing’s Live Chat to resolve a problem I have with dividend reinvestment and thought it’s a quite useful tool to have. When I first got my account at Zecco two years ago, the interface looked terrible and difficult to use. Though Zecco has done some improvements last year on its website to make it more user-friendly, the main color of gray still makes me feel a little depressed when using it. 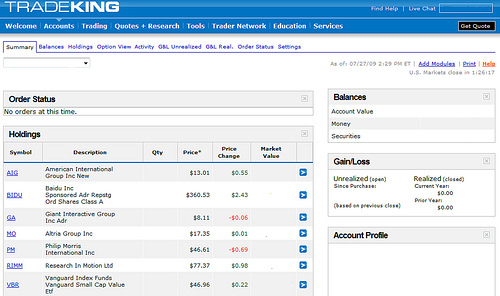 While TradeKing displays the overall gain/loss of the account, Zecco shows P&L, in both dollar amount and percentage, of each individual security on this homepage. This is quite useful because I don’t have to go back to check the trading recorders to figure out whether I make or lose money on the stocks. 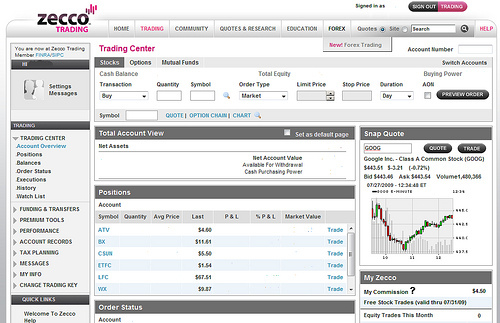 Another big plus, I think, for Zecco is that I can trade a stock right from the homepage at the top of the screen. It also allow me to trade stocks I already own without having to enter the stock symbol. 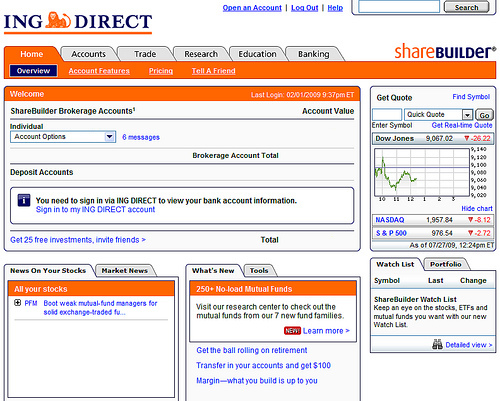 And unlike Scottrade and TradeKing, Zecco now shows the daily chart of a stock on account homepage. What I want to see is a watch list of stocks I am interested in, which isn’t available currently. Since with Zecco I can get up to 10 free trades per month if I meet certain conditions (such as $25,000 in market value or 25 or more trades per month), the information on the number of free trades available for the month is also quite useful. While I can get free trades from Zecco, many other services it offers are paid services, such as streaming quotes ($8.00/month) and GainsKeeper ($24.99 every 6 months). OptionsHouse is the latest broker account I got and the one with the lowest commission cost for stock trading. Though I am not happy with the broker’s requirement of having $100 in the account in order to make a trade (read my first trading experience for details), I am quite impressed by its interface, which looks like it’s a stand alone product. OptionsHouse is the first and only broker I am using so far to provide free, streaming real-time quotes on the web-based trading platform (the account has to be funded to get real-time quotes). Once I enter a symbol, the quote just keeps coming in real time. No need to refresh. 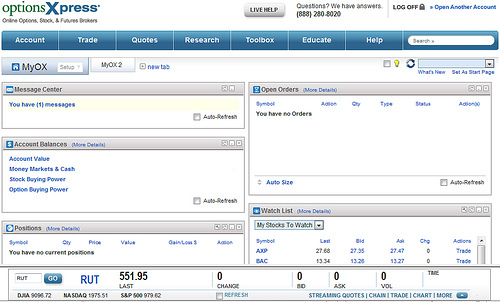 Also the SELL and BUY buttons in the quote section make trading the stock quite easier. As you can see from the screen shot, OptionsHouse also shows a stock chart, which time span from intra-day to up to 5 years, on its main interface, along with other information about the stock. The information is more comprehensive than what Zecco provides. In addition to the chart, the broker also provides traders with tools such as news, stock watch list, and index monitor without leaving the main window. If OptionsHouse eliminates the $100 deposit requirement, I may use it a little more. Since I run a Firstrade referral bonus sharing program myself, I get some bonuses for referring new customers to Firstrade once in a while. I basically just use that money to make a trade once I accumulate enough bonus, so Firstrade is no longer very active for me. What I really don’t like about Firstrade’s user account website is that the Important Notices section takes a large space right in the center of the interface. I don’t find those notices very important and they are not updated very often. I’d like to see that place used for information that’s more useful for investors. Overall, I can’t do much on the account homepage alone because, as you can see, what displayed on the homepage are not all related to trading. There are only four pre-determined indices and two index charts to display. There’ s a list of stocks to watch, but it looks like I can only enter up to seven symbols. There’s even no list of positions on the homepage, only an account number with the current market value. Even though Firstrade doesn’t have streaming real-time quotes on the account main homepage, it also has a free, real-time streaming tool that opens up in a new window from the link in the top right corner of the screen. The tool, called X-Stream Dynamic Real-Time Quotes, allows me to trade at most 20 stocks. I never used OptionsXpress to trade a stock or options, except running a referral program and using their practice account, I found that OptionsXpress’s new MyOX probably has the bast web-based trading interface that’s fully customizable. On the default MyOX page, I can see basic information of my account such as balance, positions, orders, stock/options watch list, and a quote of stock that’s not in the watch list. But that’s not all it offers. In fact, I can add a new tab if I want to have more contents, such as charts, options chain, financial news, RSS feed, etc, though they will not be on the same page. In addition, OptionsXpress also has streaming real-time quotes in a new window (use the link at the bottom of the screen). Stocks in the watch list are added to the real-time quote window, where trades can be made right from the streaming quotes window (double-click any symbol in the quote list and the symbol will appear in the order form). It’s really convenient. ShareBuilder isn’t really a platform for real-time trade because of its high commission cost. I used the broker to make a few automatic investing before, but abandoned it a couple of years ago. The main account page is quite simple as you can see from the above screen shot. No streaming real-time quote is offered by ShareBuilder. A little bit too much to ask for? Seems like you want the best for less. Who doesn’t like the best for less ? I think brokers like Scottrade and OptionsHouse are very close to what I want. Of the many i have used .. i prefer to use reliance money – the trading flow has all been quite good.. the platform is smooth too . You mention that OptionsHouse is the only one to provide free real-time streaming quotes but Scottrade’s Scottrader Streaming Quotes app is pretty decent. 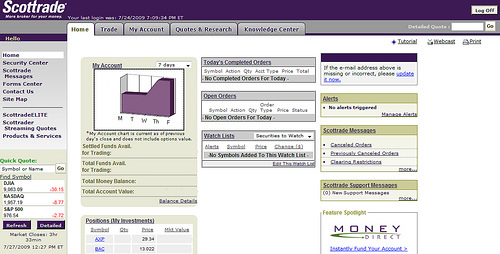 Scottrader isn’t really a web based tool, though it does require log into the web account to access quotes. That’s why I didn’t put it under the “web based” category.